I love misty evenings after rain. Well, who doesn’t. I usually go out looking for mammals or birds and I have been quite lucky with them as well 🙂 Sometimes the best photos of the day turn out to be something completely unplanned like it was with this photo. After the sun had set behind a distant forest, mist started to descend on the meadow, where I was photographing. Soon the ground was dark, with yellow and orange glow from the sky the only source of light from now on. 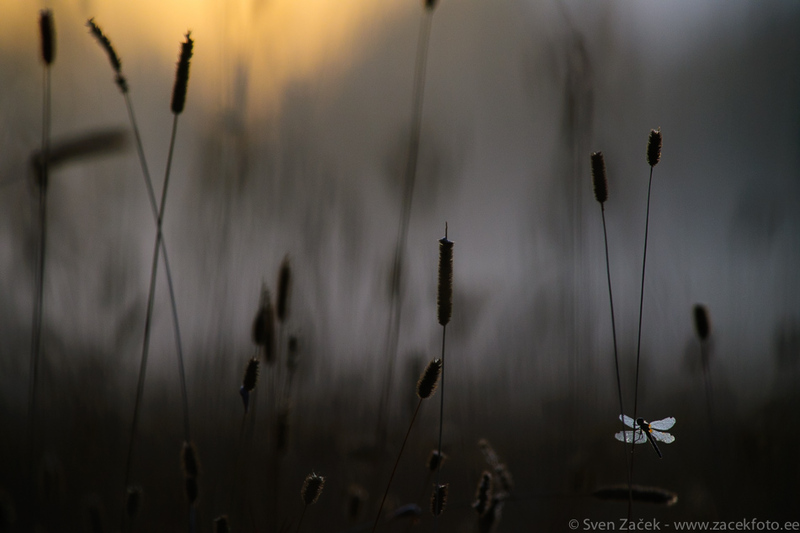 Suddenly the whole meadow lit up in tiny lights here and there, which turned out to be resting dragonflies, their moist wings reflecting the glow in the sky. Photo info - Summer: : Nikon D3x + Nikkor 300mm F2,8 VRII + Nikkor TC-17EII. F4,8, 1/400, ISO 800.